In this example of market segmentation for fitness centers the overall market is segmented into benefit segments. As implied by the word “fitness” there is a generalization that consumers visit a fitness center to get fit. However, this would be a simplification of the various consumer segments and their needs. Let’s start this market segmentation example by looking at a group of consumers who are less interested in the fitness benefits provided by a gym. In this case, the “making friends” market segment sees fitness centers as an opportunity to mix with people with similar goals and lifestyles and to make new friends. These consumers are probably moderately fit and enjoy some of the fitness activities, but their prime motivation is to fulfill their social needs. Fitness centers are able to attract and retain this consumer segment by having a defined target market (so that all gym members tend to have something in common), have a variety of exercise classes that are fun and energetic, and providing some space in the facility for mixing with other people – perhaps with a small refreshment bar/shop. The next market segment is “losing it”, which refers to the goal of losing weight. It is quite common for some gyms and fitness centers to specialize in weight loss programs and overweight people perceive that regular exercise is important for them to participate in. The best marketing approach to this market segment is to be very welcoming of these consumers and to have established programs in place to meet their needs. This is because this segment has some fear of attending a fitness center, particularly where most other customers already fit and muscular. In other words, it is an emotional support and reassurance and motivation, delivered by the fitness center staff, which is primarily the key to success with this market segment. This market segment is also a prime candidate to utilize a personal trainer. The “taking shape” market segment consists of consumers who are primarily interested in improving the look of their body, perhaps through bodybuilding and weight training, as well, as forms of body sculpture. Typically this segment is comprised of a younger demographic, but has an equal mix of males and females. This market segment is interested in both the facilities offered – in terms of weight training equipment – and suitable exercise classes that support their goals. Consumers in the “peak performers” segment are highly disciplined and self-motivated individuals when it comes to their health and fitness. They are highly focused upon achieving their personal best, in terms of running times, endurance, weight lifting, bodybuilding and so on. A downside of this market segment is sometimes they liked to “own” the gym and may dominate certain pieces of equipment and may slightly intimidate other customers as a result. These consumers are attracted by flexible opening hours and a broad choice of equipment and facilities. They will tend to be longer term customers of fitness centers, although not always loyal to one outlet. Consumers in this particular market segment attend a fitness center because they are trying to improve their health, strength, or because of “doctor’s orders”. They typically do not overly enjoy exercise programs, perhaps seeing it as a chore. These consumers can benefit from personal trainers and relationships with fitness center staff, which should increase their level of attendance. Unfortunately, due to a lack of enjoyment or underlying motivation, many of these customers tend to be infrequent visitors or short-term clients. 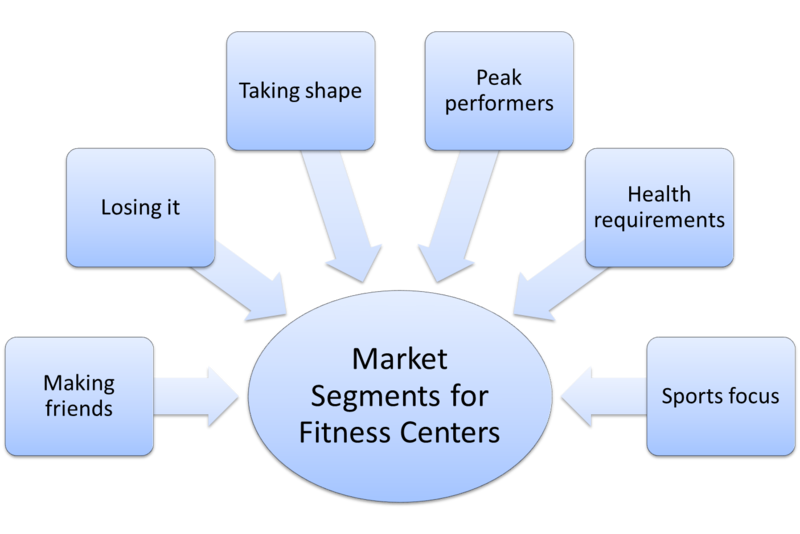 The last market segment in this example are those consumers who are heavily involved in sport, perhaps at competitive level, and use a fitness center to help improve their strength and general fitness in order to participate in their chosen sport. They are generally quite motivated and are looking for exercise classes and equipment which are supportive of their particular sporting requirements.